A bike trip in the country leads to a dangerous twist as Nancy’s ride takes a sudden, nasty turn. After catching a jewel thief in the act, Nancy hopes to steal a little time for herself. A three-day bike ride with Ned, George, and a group of Emerson College students seems the perfect escape—until a series of “accidents” puts them all on a definite downhill course. And to add insult to injury, the rider most at risk is Nancy’s friend George! But why would someone want to harm George—a girl who has never hurt anyone? 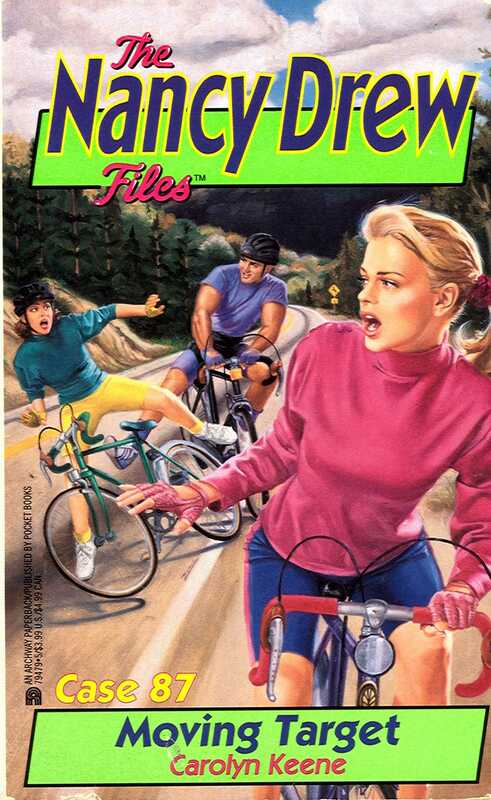 Nancy knows she’ll have to find answers quickly before the trip takes a dangerous detour and her friend’s ten-speed spins out of control. A deadly secret has come along for the ride, and getting it out in the open may be the only way to save George’s life! Not for me!" Nancy Drew held up her hand to halt Ned Nickerson, who was about to put another helping of pasta on her plate. "One more mouthful," she continued, her blue eyes sparkling mischievously, "and you'll have to roll me out of here." "Can't have that," Ned replied, grinning. He looked across the table at Nancy's friend, George Fayne. "George?" The dark-haired girl shook her head and groaned. "I think I've reached my limit, too," she replied. "But ask the waiter if we can take the rest with us," she added. "It'll be a great carbo-load in the morning before we start off." "Spaghetti for breakfast?" The disdain in Kendra Matthews's voice was unmistakable, and she wrinkled her nose disapprovingly. "Not to worry," said George cheerfully, deliberately ignoring the put-down as she peered into the large crockery bowl on the table. "I don't think there's enough for both of us." She glanced over at Nancy. "Too bad Bess isn't here," she said. "She would have loved this dinner!" She paused. "Of course, she would have had to start a new diet tomorrow, too!" "You're probably right," Nancy agreed. Bess Marvin, George's cousin, was usually along when Nancy and George went anywhere, but sports were not her strong suit, so she had decided to pass on the bike trip. Ned, a student at Emerson College, had invited Nancy and George to join a group of students for a three-day bike trip during Emerson's fall weekend. The spaghetti dinner at a small, family-style Italian restaurant just off campus had been planned so the cyclists could meet one another before the ride. Besides Kendra Matthews, the girls had met CJ Springer, a tall, blond biology major whose studious appearance behind rimless glasses contrasted sharply with his muscular build. And then there was Erik Olson, who was leading the group and who had taken every opportunity during dinner to remind the rest of the group that he was Emerson's top cyclist. "You'll need all the help you can get if you want to keep up with me," Erik said to George. She had told him that she was competing in the women's division of the same thirty-kilometer race he had signed up for the following month. "I just finished a ride in Colorado," he continued, before she had a chance to respond. "Uphill, high altitude. Not much oxygen up there. That's where you separate the pros from the amateurs. You have to be physically fit." "I thought this was a recreational ride, not a race," said Nancy, attempting to head off a clash between George and Erik. "Every ride is a race," Erik said. "And I've never been in better shape." A slight smile that was more like a sneer crossed his face. He turned to George. "But unless I'm mistaken, you walked in here tonight favoring your left leg." Even in the muted candlelight of the restaurant Nancy could see George's face flush. "I twisted my knee last week," she said defensively. "But it'll be totally healed by next month." "Well, you two can race all you like," said Kendra. "I signed up for this bike trip so I could get better acquainted with one CJ Springer." She slipped her small, beautifully manicured hand over CJ's big one and smiled up at him. Nancy noticed that several expensive rings flashed on her fingers. They went right along with the designer sports outfit she wore. Obviously Kendra Matthews was not hurting for money. CJ cleared his throat, and Nancy could sense his embarrassment. He seemed to be a shy per son, not used to this kind of open attention. "I think a man with brawn and brains is a real prize," Kendra cooed, seemingly unaware of CJ's discomfort. Despite her dislike for Kendra's boldness and insensitive approach, Nancy had to admit that her own motives weren't so different from Kendra's. She had signed up for the trip so she and Ned would have some time together. With her busy schedule and Ned in classes, they hadn't been able to spend much time together lately. "It's too bad the other girl who's going couldn't be here tonight," Nancy said. "What's her name? Jennifer?" Erik nodded. "Jennifer Bover. She works nights at Ed's Diner, on the other side of town. I don't think anybody really knows her." He looked around at the other Emerson students, and there was a general shaking of heads. "All I know is that she's a transfer student and she's in my psych class. She just signed up for the trip yesterday." "Well, we'll meet Jennifer tomorrow," said Ned, getting up. "Tonight we should probably get some sleep." Once outside, they gathered on the sidewalk in front of the restaurant to recheck last minute details. "Rats!" said George. "I forgot my breakfast." "I'll get it," Nancy said quickly. Even though George claimed that her knee had almost completely healed, Nancy was concerned about her friend walking any more than necessary. She darted back into the restaurant and returned a few moments later, carrying the carton of spaghetti. "See you all in the morning," Erik said. "I'm going to jog around campus once before I hit the dorm." He looked over at George. "Would you care to join me?" he asked. "Negative," said George, scowling after him as he jogged off without waiting for an answer. "There goes Mr. Personality!" George said. "I wonder if they cover behavior modification in that psych class he's taking." CJ, who was standing next to George, grinned. "Take care of that knee," he said quietly, leaning over so she could hear him. "Ice it tonight and sleep with it propped up. It might help." George smiled back at him. "Thanks," she said. "I will." Kendra tapped her foot on the sidewalk, openly annoyed with the attention CJ was paying George. She reached for his arm and tossed her long black hair back over her shoulder with an impatient gesture. "I think it's time to go," she said to CJ. "Right!" He turned to the trio beside him. "Would you guys like a lift? I'm in the parking lot over there." Nancy looked at George, once again thinking about her knee. "No, thanks," George replied quickly. "We're going to walk back across campus. See you tomorrow." Nancy, George, and Ned crossed the street, heading toward Packard Hall, the Emerson dorm in which George and Nancy had been given a room. "You could have taken a ride," Nancy said to George. George grinned. "If I'd accepted a ride, I might never have reached the dorm alive," she quipped. "Talk about territorial rights. Kendra's got him staked out and barb-wired." Ned laughed. "That's what it looks like, but it's definitely a one-sided attraction. CJ and I have a couple of classes together, and we've gotten friendly." "I liked him," George said, in her usual forthright way. "But the two of them together seem like the world's biggest mismatch." "You've got that right," Ned replied. "Kendra's been pursuing him since the semester began. She even signed up for molecular biology just because he was in the class. That's how she heard he was going on the bike trip. He'll shake loose, but he's a nice guy, and he'll do it his way. He certainly doesn't encourage her." Ned slipped his arm around Nancy's shoulders. The night was clear, and the air was crisp with the smell of autumn. Overhead, thousands of stars shimmered against the midnight blue sky. It was a perfect fall night in the Midwest. and it promised a perfect long weekend for nature lovers and cyclists. "What's that building over there?" George asked, pointing toward a large brick structure with a dome on top. "That's the science observatory," Ned answered, "and the one coming up here on our left is the president's house. That's the back of it we're seeing. It faces the road over there, but the back is as pretty as the front." ," Nancy said. "Something about an award? I'm trying to remember." "Your memory's doing fine," said Ned. "He and his wife were invited to accept an award for Emerson's student exchange program. It's one of the best in the nation. They left yesterday." The trio was parallel to the spacious back gardens of the three-story house, where the lawns sloped down to a deck and swimming pool, covered now for the off-season. Beyond the pool, Nancy could see a small, low, glassed-in building adjoining the back of the mansion. It looked like a hothouse. As often happened with them, Ned was reading her thoughts. "The president used to teach botany," he explained. "He just couldn't give it up when he got into administration. I understand that he grows all sorts of exotic plants in there -- even orchids." Ned gestured toward the darkened rear of the house, but Nancy was already staring in that direction. "Ned, I saw a light over there. Someone's out on the patio." She squinted for a better look and pointed. "See? By the French doors. He's wearing a ski mask! It's got to be a burglar." With that, Nancy bolted across the lawn, up toward the building. But the intruder must have seen her coming, for he moved quickly around the far side of the house, out of view. Nancy ran full speed around the mansion. Ned, surprised by Nancy's quick reaction, hesitated a moment, then broke into a run behind her, with George following. The masked person, dressed in dark pants and a dark turtleneck, was racing toward a motorcycle parked in the driveway. Nancy could feel her heart pounding as she ran across the front lawn. She was gaining on him. Only thirty feet separated them now. As agile and quick as a panther, the prowler jumped on the motorcycle and started it up. Nancy ran out into the driveway, still determined to catch him. But instead of heading for the street, he suddenly whirled the bike around and, revving the engine, aimed the motorcycle directly at her!